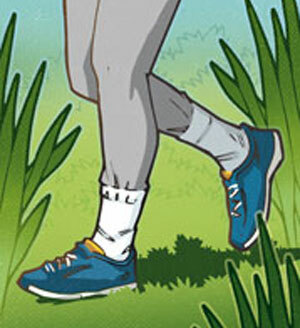 Put your pants in your socks, ticks won’t be able to grab your skin. 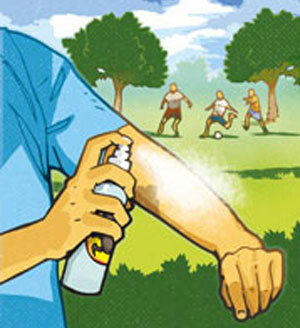 Use an anti-tick spray on your clothing and skin. Avoid walking or resting in places were ticks live, such as the edge of the forest, on the sidewalk, in the bushes, and tall grass. Be particularly alert during Spring and Fall. Wear light color clothing. Ticks will be more visible and allow you to remove them before they bite you. Let’s not forget that ticks only transmit microbes during their bloodmeal. The risk of transmission increases when it lasts more than 24 hours. 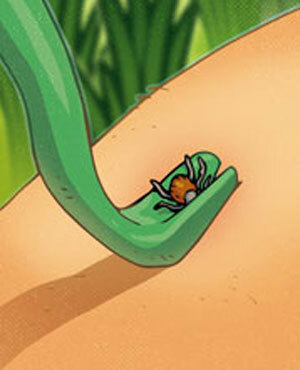 Therefore, it is important to remove the tick off the skin as fast as possible. After a walk, let’s thoroughly inspect all our body parts and especially warm and humid parts that thick particularly enjoy, such as the knee fold, armpits or kids’ scalp. What if I find a tick on myself? Don’t panic! Simply take it off using fine tweezers. A magnifying glass can be helpful. Grab the head of the tick with the tweezer at the edge of the skin and pull upward in a steady motion. Then carefully disinfect the bite. Other chemical products because they increase the risk of microbe transmission by making the tick « throw up ». In case of fever or symptoms similar to Lyme’s disease or Tick-born Encephalitis, seek out a doctor immediately. An effective vaccine against the Tick-borne virus encephalitis caused by the TBE virus exists and requires three injections. It is advised by the federal office of public health starting at 6 years of age for any person living or temporarily staying in at risk areas and those working in the forest (lumberjacks, forest rangers).